Hae Mee, Prawn Noodle, or Penang Hokkien Noodle is a popular street food in Malaysia. 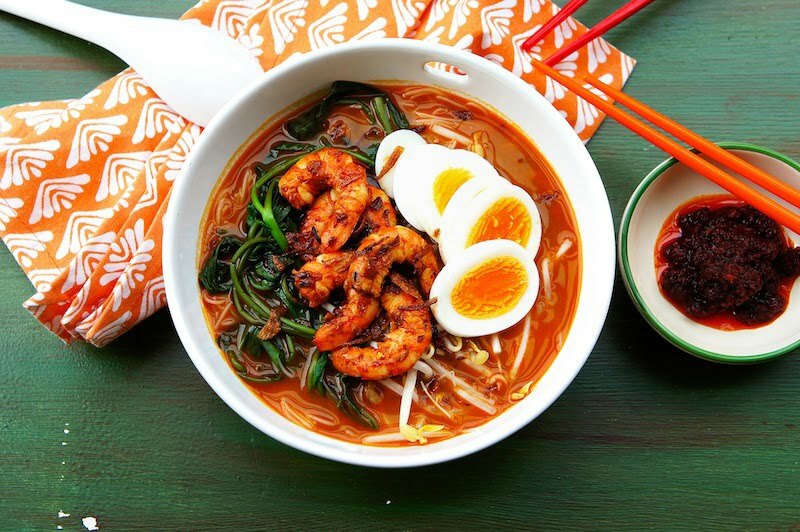 The slightly spicy, sweet, and savory soup for this delicious noodle is made with sambal paste, whole prawns, prawns' heads & shells, and chunks of pork ribs, or chicken bones. This noodle recipe will take about a couple of hours to prepare; but, if you like prawns like I do, then chances are you will enjoy this tasty noodle soup. For the Soup Base 1 (Chicken Stock): Combine chicken carcass, dried anchovies (place in a herb bag), and water. Bring it to a boil, and lower the heat. Simmer for about an hour. Strain into a clean soup pot. While, the prawn soup base is simmering, blend together the soak dried chilies, shallots, garlic, and belachan. Then heat up a wok or pot, add the peanut oil and cook the sambal until fragrant, season with sea salt and palm sugar. Remove half of the cooked samba paste (for the soup base 2). In the same wok or pan with the remainder sambal paste, add the prawns and cook over moderate to high heat, Stir-fry briefly until the prawns are cooked. When the soup base 2 is ready, switch off the heat. Blend the prawn shells, head, and dried shrimps until finely. Then strain the mixture with a fine sieve into the soup base1. Add the reserved sambal paste, rock sugar and bring it to a boil. Lower the heat, and simmer for another 30 minutes. Season the soup with sea salt, and adjust the seasoning with extra sugar, if necessary. Then prepare the rest of the ingredients. Cook the rice vermicelli according to the package instructions. Blanch the yellow noodles, water spinach (KangKung), and Bean Sprouts (Taugeh). To serve the Hae Mee: Place a portion of rice vermicelli, yellow noodles, water spinach, bean sprouts, sambal prawns and egg in a bowl. Ladle the hot stock and sprinkle with deep fried shallots and served immediately. WOW, looks amazing this dish! Great recipe! I just adore the colours in this dish. Although it looks time-consuming I'm sure it's worth the effort! !